And the frog fell down to the ground! Where did the frog live? Why did the frog ask the birds to take her to another lake? How did the birds carry the frog to another lake? Why did the frog open her mouth? Is the frog clever or silly? Why do you think so? 1). The frog lived in a lake. / The dog lived in a lake. 2). She had two friends, two big birds. / She had two big birds, two friends. 3). But the birds wanted to go to another lake. 1). I shall take one end, my friend will take the other end, and you must take the stick in your mouth in the middle. 2). When they flew, they saw children in the field. “My good friends take me with you,” said the frog. 1). But the birds wanted to go to another lake. 2). The frog lived in a lake. 3). She had two friends, two big birds. 4). “Very well,” said one of the birds. 6). “My good friends, take me with you,” said the frog. 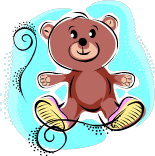 Listen to the story about three bears and say what has happened to Mary when she lost her way. Once upon a time there was a girl. Her name was Mary. She went to the forest on Sunday morning and lost her way. Soon she saw a nice house in the forest. There was a little kitchen garden near the house. In front of it there was a flowerbed. There were many beautiful flowers in it. On the right there was a cosy garage with a modern car. Mary liked the house very much. First she entered the living room. On the walls there were portraits of Mr. Bear and Mrs. Bear and their little son Mike. On the table she saw many tasty things. Then Mary entered the bedroom. There were three cosy beds in it. She liked the rooms. Many months passed. One day the children saw a beautiful picture: two large bears, a baby bear and a girl were in the forest. The bears were skiing. And Mary and Mike were sledging. They were happy.